George Hart, Orb, 24x24x24 inches, laser-cut wood, 2014. 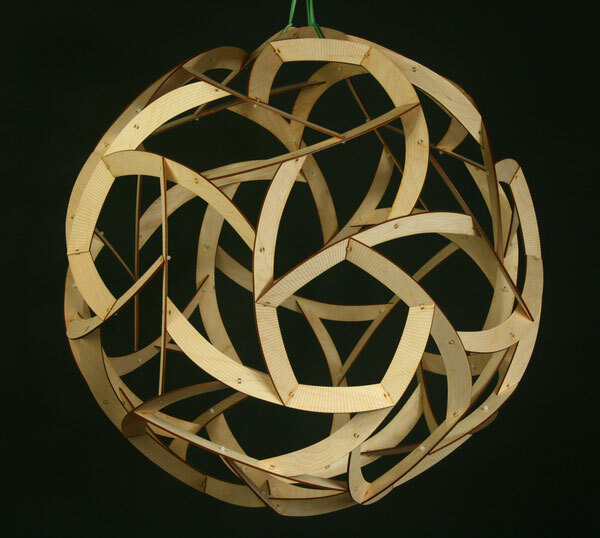 According to Hart, these sixty identical laser-cut and laser-etched wood components illustrate chiral icosahedral symmetry (courtesy: Mathematical Association of America). While translating Geet Chaturvedi’s works, I asked him once, “Who do you write for?” He replied simply, “I write primarily for myself. Every other person reading my work is an added bonus.” Then he proceeded to tell a delightful tale from an ancient Indian epic, Brihat-Katha, by Gunadhya: “Shiva was narrating a story to his wife Parvati in privacy when from behind the walls one of Shiva’s servants overheard it, and in his next birth wrote it and made the story widely accessible. For Shiva the storyteller, the audience was just one, but in reality, the audience was two, and in greater reality, the audience was in the millions. Since Parvati is considered the other half of Shiva—Shiva being a half-man, half-woman God—he was, in actuality, narrating the story to himself. There was no audience other than the narrator.” Geet said, “For me, audience is an imaginary or hypothetical term, the audience is simply the other half who’s listening; this other half can be self or readers—one, two, any number—who love literary work.” Fittingly, Geet is widely read and holds a unique position among Indian writers as an author, poet, and translator. From 1994 to 2016, over two decades, he has written several works of fiction, articles, and poetry and translated works into Hindi. Born in Mumbai, Geet studied Buddhism and Advaita, reaching to their deep recesses, and wrote extensively on their subjects, both in prose and verse forms; his writings have since received the different shades of compassion and passion and also earned him various titles like “professor,” “master,” “scholar,” etc. “The Tongue of Kumārajīva” is a myth that reflects the poet’s great affinity toward the Pali poetic tradition of Indian poetry (which isn’t spoken about much in present times) and virtues of integrity. Such mythic memories are the magnified translations of our faint, ordinary memories. “The Tongue” is a reflection of the importance of translators who are often sidelined or ignored. To translate is, in a way, to retain hope. Translating a deep and artistic poem is to stand in favour of poetry and hope in times of the vapid sensationalism of poetry. Authentic, passionate, and truthful, Kumārajīva’s tongue is not just one man’s tongue but an invincible endeavour toward the motif of giving rather than receiving wherein even after being destroyed, the passion for hope and life is still intact. In “My Language, My Future,” the poet talks about language and the state of poetry in that language, memory, despair, and hope. With these as main voices, he also presents a sociopolitical commentary with fine covertness. “The most senile poet of my language” or “the oldest poet” is a character that appears in Geet’s poems often, sometimes in the role of a fictitious old man, sometimes in the role of the poet himself, describing and raising questions about his future. Questions have been raised about the future of Hindi too—a widely spoken language, nevertheless underrepresented not only in the world but even in India. It is no more the language of power or employment, art, culture, wisdom, or intellect. The poet (in plural sense here) fears that he’ll be ignored even more on growing old. He’d only be left with the 330 million gods as his cultural memories, and his body hairs as the unwritten poems—referring to a myth in which Shiva’s hairs are described as his future avatars not yet taken, thus, in a way, speaking of hope even from the unwritten literature. Whether Hindi would lose its identity or even script is often a subject of debate in India. I do not know if this will happen, but the poem does touch this dystopia. There is abundant contextual reference in Geet Chaturvedi’s poetry—a presupposed tale, myth, or custom that is buried deep in the roots of Indian culture. So varied is the subject matter with multiple themes and different voices, even in a single poem, that I have coined the neologism “transvariegation”—much like Haroldo de Campos—for my translations of Geet’s works. In fact, I have translated just this writer, extensively. The focused study gives a depth to understanding the author’s work, his methodology, and the associated landscape of moods, emotions, feelings, and ecological interactions. Also, the translator knows the favourite phrases, words, textures, and flavours that the author would use in a given circumstance and the means of re-creating them. My grounding in mathematics and computer science has helped me to devise my own class library replete with common phrases and equivalent words, metonyms, synonyms, and metaphrases that I reuse, following the beautiful UNIX philosophy of reusing the code. It has also made me appreciate Geet’s innovation in the language, construct, patterns, and his search for new expressions inside the language. Such mythic memories are the magnified translations of our faint, ordinary memories. To me, translation or “bearing across” of text is, in mathematical language, all about forming “chirals”—transformations and deformations like our two hands, which are chirals to each other; they cannot be superimposed, are patterns in asymmetry, yet always preserve the invariant, inherent character. From Donald Knuth and Ashoke Sen to Czesław Miłosz and Geet Chaturvedi, it has been, for me, a joyous, roller-coaster switch.